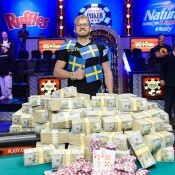 Why don't more people care about someone winning $8.9M? 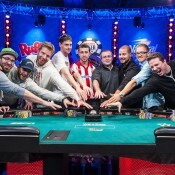 While this year’s WSOP Main Event final table certainly lacked the draw of 2009 (with the dominant Phil Ivey and Darvin Moon storylines) or 2008 (first year of the November Nine concept plus when Dennis Phillips captured the first of his back-to-back WSOP ME titles), we didn’t think it lacked that much appeal. 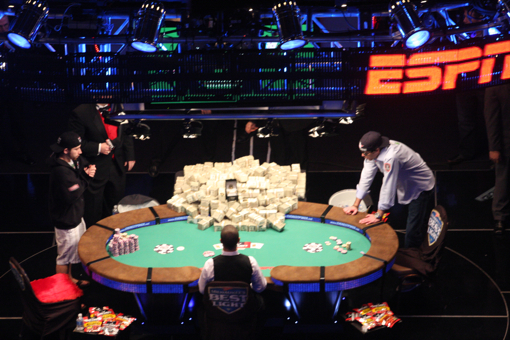 ESPN’s 2010 WSOP Main Event final table broadcast drew 1.563 million viewers for a 1.1 rating (and .6 in the coveted Adult 18-49 demo), down math math math 26% from last year. If we’re reading this right, then this year’s final table drew less households than the epic Jerry Yang 2007 broadcast. In fairness, the ratings still ranked 9th overall for the night on cable, and 8th in the coveted Adult 18-49 demo. It’s also possible ratings dropped in part due to the ESPN3 live stream. And year-to-year comparables will be somewhat off as the broadcast aired an hour later (10pm ET) this year. Regardless, down is bad and up is good. We’ll wait for the final Neilsen ratings to come out for final analysis, but get a quick look at the overnights from TV By the Numbers here. maybe they could advertise it a bit and not air it at 10pm? late start time, lack of promotion, viewer fatigue from week after week of ME episodes (watch today as they play from 241 down to 214 players! 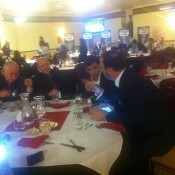 ), the fact that almost everyone at the final table was a twenty-something male. They aired it too late . Not to mention the economy with people cutting cable to save money. I wish I had ESPN3 cuz I’d rather watch the uncut version .